The semi-private course is open from April 1 through November 1 From Dawn to Dusk. Olive Glenn Golf Club is located in the broad valley where the Shoshone River emerges from the snowcapped Rockies in northwest Wyoming. Here the skies are wide and blue, the air is clean and filled with the scent of sage, deer and antelope play, and buffalo still roam less than an hour's drive away in Yellowstone National Park. The semi-private course is open from April 1 through November 1. The course offers a full service PGA staffed golf shop and features a practice range and putting green on site. 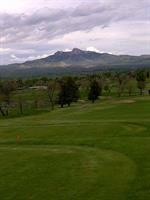 Daily play is welcome; tee times are available one week in advance by contacting the golf shop at (307) 587-5551. Other Club facilities including the full-service restaurant, are open year-round. Stampede Bar & Grill - open to the public, Mon-Sat: 11-4pm. Full service PGA staffed golf shop.